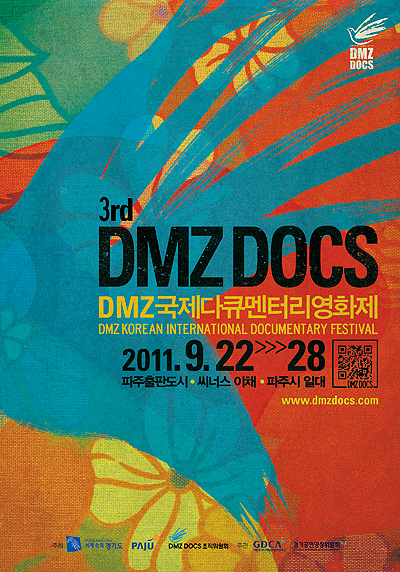 The 3rd DMZ Korean International Documentary Film Festival (DMZ Docs 2011) wrapped with a screening of the international competition top award winner, The Tiniest Place. Directed by Tatiana HUEZO, the Mexican film won the White Goose Award which comes with KW15 million and the honor of screening as the festival’s Closing Film. Running for seven days, the documentary film festival was held primarily in around Paju City, led by co-festival directors CHO Jae-hyun and YOO Ji-tae. DMZ Docs 2011 screened 100 films from 30 countries with a focus on works that dealt with the concepts of peace, life and communication, as befitting a festival founded around the border between North and South Korea. DMZ Docs’ Special Jury Award this year went to Bombay Beach, a US film directed by Alma HAREL. The award comes with KW7 million in cash money. The Best Korean Documentary Award (with KW10 million) went to My Father’s House, directed by KANG YU Ga-ram. The Audience Award (KW3 million) went to LEE Jung-ho’s Goodbye Homerun. For the Youth Competition, the Excellence Award went to High School Student’s Guide to Be a Filmmaker, directed by KIM Seul-kee with 9 filmmakers. The group of directors are part of an association of film and media clubs in high schools in Gangleung. The Best Youth Documentary Award (with KW 1 million) went to Uncomfortable Eyes, Uncomfortable Truth. The film is directed by high school students YOU Seok-hyun and PARK Ka-young. As part of an intiative to develop the media industry in Gyeonggi Province, DMZ Docs is organized by Gyeonggi Provincial Government, Paju City Hall and the DMZ Docs Organizing Committee and is supervised by Gyeonggi Digital Contents Agency and Gyeonggi Performance and Film Committee.